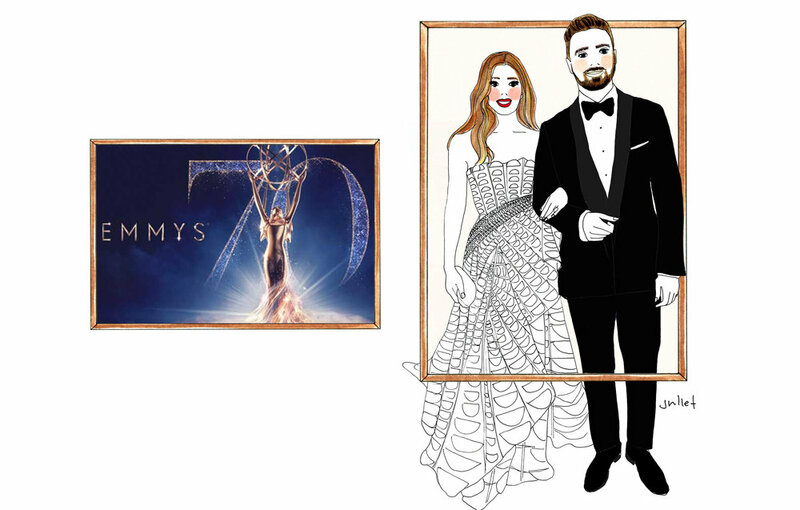 The 70th annual Primetime Emmy Awards were presented yesterday in Los Angeles at the Microsoft Theatre. Here’s a link to the winner’s in case you need some suggestions for what to watch next: 2018 Emmy Awards Winners. And keep reading for my commentary on the fashion looks that I loved. I polled each look on Instagram and have documented the results so you can see how they voted. I am really into Elisabeth Moss as a blonde, especially this shade. I think it’s super fun and super fashion. Moss is wearing custom Vera Wang and I think these Louboutin’s: Follies Strass. For a breakdown of her beauty look head here: Exclusive: See Elisabeth Moss Get Ready For The Emmys. Elisabeth Moss was nominated for outstanding lead actress for her role in The Handmaid’s Tale, but lost to Claire Foy for The Crown. I really do like Millie Bobby Brown in Calvin Klein By Appointment. One of my insta Friends suggested that “…I feel like Raf is trying to relive his Dior moment.” And OMG, he so is! Brown was nominated for outstanding supporting actress in a drama series, for her role in Stranger Things. Unfortunately she lost to Thandie Newton for Westworld. Jonathan Van Ness is totally fashion. I’ve always been a fan of Non-Gender-Based dressing, so it makes me really happy when people don’t let their gender dictate what they should or should not wear. I also love how Van Ness has not limited himself to wearing only one designer. His tux is by Stella McCartney, his turt (turtle neck) is Prada and the Ascot bag by The Row. I’m so in love with that bag, it actually reminds me of Simone Rocha’s Bow Taffeta Bag which sat in my shopping cart for weeks and is now sold out on Netaporter. Kerri Russell looked super hot in this Zuhair Murad Spring 2018 Couture look. 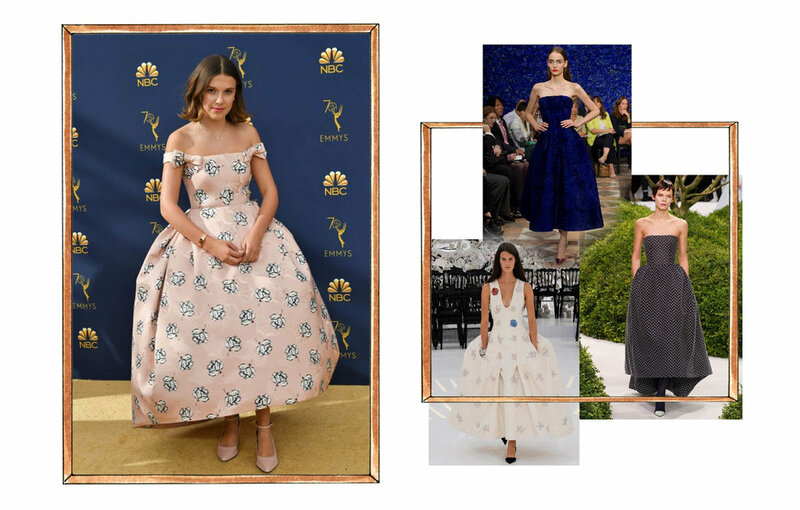 Russell was nominated for outstanding lead actress in a drama series, for her role in ‘The Americans.’ Zuhair Murad describes the look as “..black crepe beaded jacket…adorned with feathers…peplum detail at the waist...with a black pleated chiffon skirt”, divine. Russell looks just as good as the model featured below, if not better. Most fun award goes to Tracee Ellis Ross who was nomiated for outstanding lead actress in a comedy series, for her role in ‘black-ish.’ Ross wore a look from Maison Valentino’s FW 18/19 Haute Couture collection. She must have a soft spot for pink clouds of fabric, as I remembered she wore a very similar Michael Kors look to the Met Gala earlier this year. Another fun look on the Emmy’s carpet. 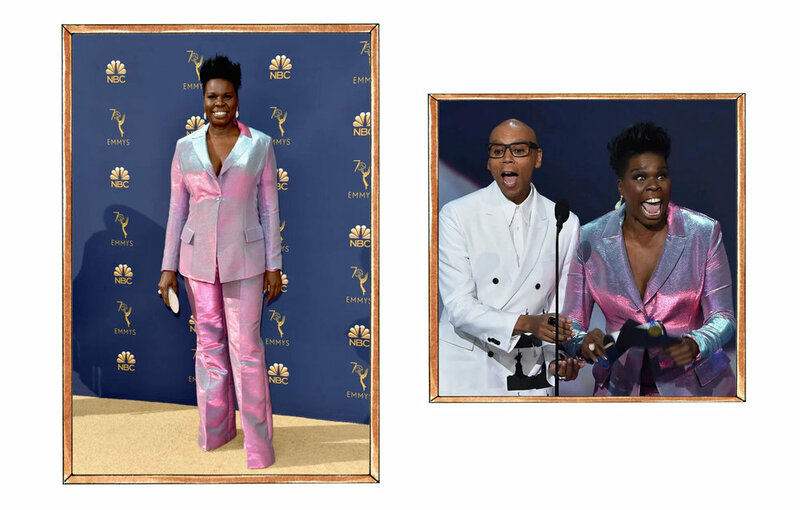 I loved this iridescent Christian Siriano suit on Leslie Jones. I think the colour looks super fab on her. I also noticed that a lot more women are choosing to wear suits lately and I’m loving it. Jones was nominated for outstanding supporting actress in a comedy series, for her various roles on Saturday Night Live. Insta Poll: 61% thumbs up, 39% thumbs down. Yass, have totally been noticing women in suits more and more, and to be honest I love it. The two examples here are of my fave actresses, Blake Lively and Cate Blanchett. Both have coincidentally been wearing more suits since the release of their respective films, A Simple Favour and Ocean’s 8. Both of their characters wear suits in the films, and for the press tours, both Lively and Blanchett have been totally killing it. 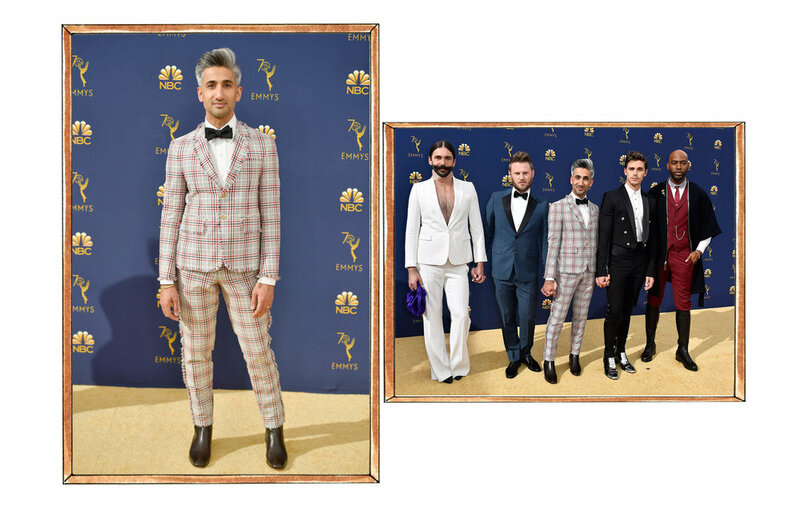 Tan France in a Thom Browne suit looking super stylish. I have included an image of all of the cast together because they actually all look great. Hopefully they will act as inspiration to other men to try something other than the classic black suit. On my to-do list is: WATCH STRANGER THINGS. This is a result of a number of messages telling me to do so after I didn’t recognise any of the Stranger Things cast members. Sorry, my excuse is that I was home alone when the first season came out and was too chicken to watch it by myself. I noticed the young men looking particularly stylish, especially Joe Keery in Dolce and that mane! That was fun. Until next time!